Flowers of Harmony tapestry shows a bouquet of flowers in an alcove. This beautiful work by artist Riccardo Bianchi, shows a richly colored bouquet of a variety of flowers including yellow and pink tulips, carnations, roses, daisies in an arrangement which makes a gorgeous and most harmonious composition of colors and textures. The work of Bianchi has the remarkable hallmarks of classicism and realism. Look at the rising arrangement of flowers. There are a couple of blooms which have overflowed onto the base of the alcove below. 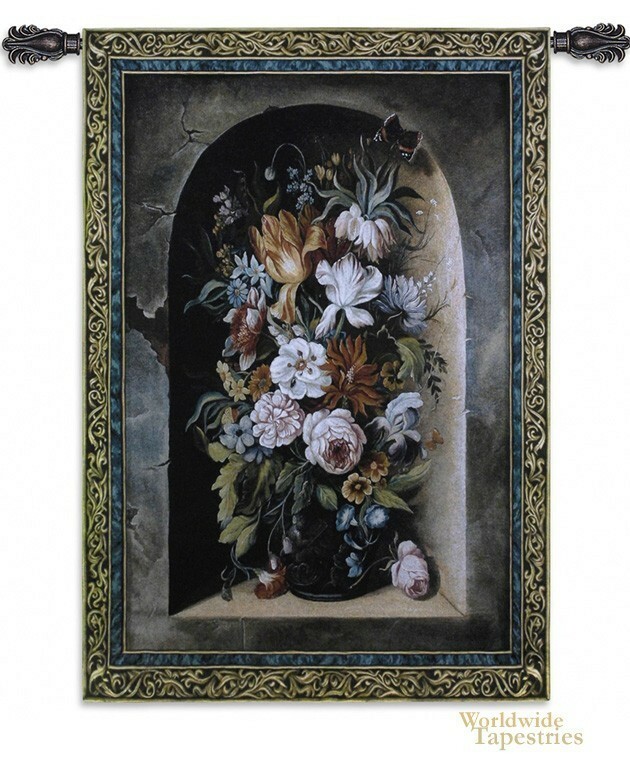 This floral tapestry "Flowers of Harmony" is backed with lining and has a tunnel for easy hanging. Note: Tapestry rods and tassels, where pictured, are not included in the price.